Protect you & your loved ones! Get the most extensive marketing. Get a Tailored high-level of service. Every staff is proficient in all aspects. Piece of mind for Landlords. ... Lee-on-the-Solent's ONLY all encompassing Estate Agent. 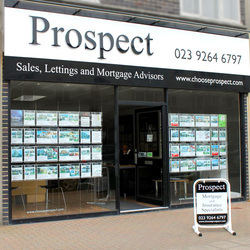 Based in Lee-on-the-Solent, not only will Prospect offer you exceptional estate agency services along Hampshire's South Coast, but also Mortgage Services and other Financial Advice needed along your property journey! Benefit from the fact we do not recruit anyone with less than 6+yrs experience - Proving we're totally committed to providing you with a professional and personal service. Publicly comment here & now - As with everything we do, we strive to think outside the box for you. Alternatively, you may prefer to privately message us? Tweet us! Perhaps about your experience here today?